IronPigs Charities, presented by The Air Production Foundation, a non-profit organization striving to provide educational and recreational opportunities for children in the Greater Lehigh Valley area, awarded a record-breaking 101,897.45 in cash grants to 22 non-profit organizations during Thursday's Phillies Winter Banquet at the Sands Events Center. Since debuting in 2008, IronPigs Charities has contributed a total in excess of $750,000 in cash grants to dozens of local non-profit entities. Between the IronPigs Charities organization and the Lehigh Valley IronPigs, the total all-time cash distribution is nearing $1.1-million. 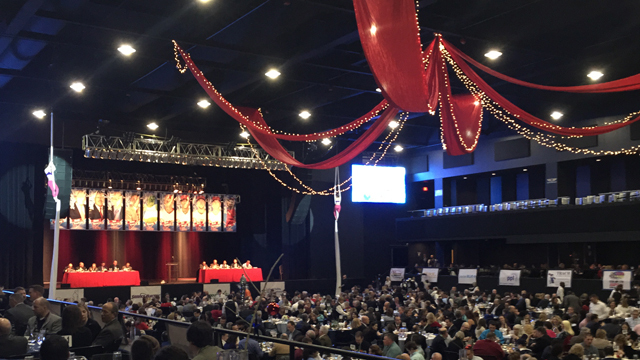 "The Phillies Winter Banquet, coupled with the opportunity to make meaningful donations to so many deserving local organizations, is truly the highlight of our year," remarked IronPigs Charities President Kurt Landes. "It's genuinely humbling to be in such a position to be able to impact our community in such a significant manner. And, the best is yet to come." Philadelphia Phillies general manager Ruben Amaro, Jr., manager Ryne Sandberg along with OF Ben Revere, INF/OF Darin Ruf and RHP David Buchanan headlined the 2015 Phillies Winter Banquet presented by The Air Products Foundation, Lehigh Valley Health Network, Service Electric Cable TV & Communications and Good Shepherd Rehabilitation Network. Other Phillies dignitaries included broadcaster Tom McCarthy, Assistant General Manager Scott Proefrock and Assistant Director of Player Develoment Steve Noworyta. The Phillies Winter Banquet beneficiary, IronPigs Charities, is a recognized 501(c) (3) non-profit organization on the state and federal level. The annual Phillies Winter Banquet is IronPigs Charities' flagship event and all of the money raised at the event directly benefits IronPigs Charities. To order season tickets, mini plans or group tickets for the 2015 IronPigs season presented by Capital BlueCross, visit the brand-new IronPigsTix.com, call (610) 841-PIGS (7447) or visit Coca-Cola Park's ticket office during normal business hours.